Two more teasers below. Sam Concepcion is Peter Pan, Michael Williams is Captain Hook (mahvelous--check out the vid! ), in Peter Pan--A Musical Adventure, which opened yesterday and runs until October 30 at the Meralco Theater. 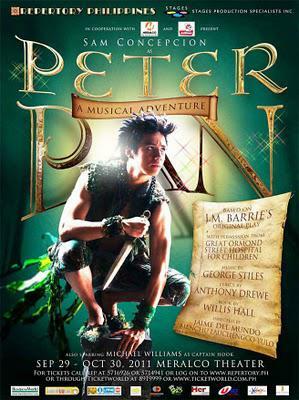 Peter Pan has new music by George Stiles and Anthony Drewe and the late Willis Hall. Pinky Marquez plays Mrs. Darling, Kyla Rivera is Tinkerbell, Joy Virata is the Narrator, Tippy Dos Santos and Cara Barredo alternate as Wendy, and Kakki Teodoro is Tiger Lily. Peter Pan is directed by Jaime del Mundo and Rep's associate artistic director Menchu Lauchengco-Yulo, with musical direction by Jojo Malferrari, choreography by Deana Aquino, set design by Gino Gonzales, costume design by Raven Ong and lighting design by John Batalla. Contact 5716926 and 5714941 or email [email protected] Tickets are also available at Ticketworld 8919999 or www.ticketworld.com.ph. Visit www.repertory.ph, subscribe to youtube.com/repertoryphils and add “Rep Phils” in Facebook.